Upon our exit from the mangrove, huge flats appear on each side of a main channel, with blue water coming directly from the reef. We went down gently and pole the skiff on either side of this aquatic highway. We had a perfect incoming tide and within a few hours, we saw about fifteen big permits between 20 and 40 lbs! We tried, unsuccessfully, five or six different crab and shrimp patterns. It was all a puzzle waiting to be solved, so we were trying out different methods. You never knew which one will work! 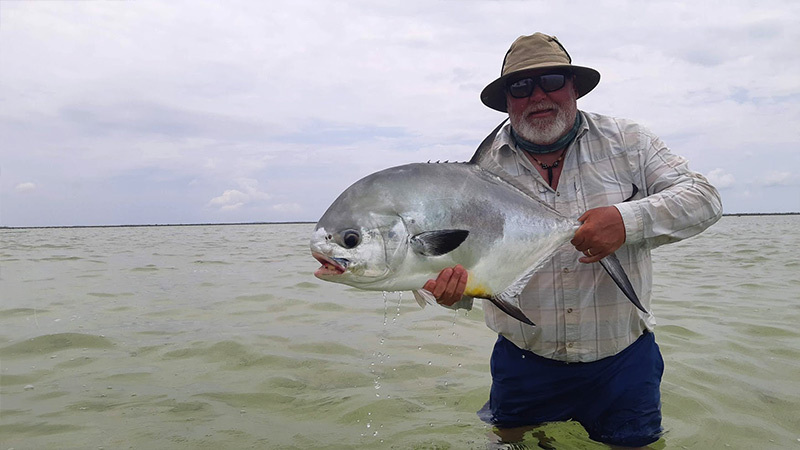 Jean-Paul returned to the skiff having had four impressive fish chase his tan and brown Del Merkins fly – but no commitments! I came back to this spot three times during the trip and finally found a fly that makes the difference: The Dean Perez Velcro Crab. I used it successfully in Cuba Cayo Cruz a few months earlier, and it did its job outstandingly. I hooked four permits with this fly and landed three to redeem my honour. Scouting the beautiful outer islands The favourable permit condition subsided for some time, and this meant I could explore other areas of this huge atoll and especially its incredible outer islands. It took us around one hour on a very fast boat to reach the first of these “Cayes” overlooking the reef. A chain of nine remote uninhabited islands extend from the tip of Long Caye towards Acklins with twenty kilometres of flats and creeks with turquoise waters. I’ve never seen a more beautiful place in the Caribbean and I was already dreaming of a small house on stilts, with iguanas, ospreys, and fish of course, as neighbours! We started wading on the firstIn fact, I was surrounded by hundreds and hundreds of bonefish! of these outside cayes on a vast turtle grass flat. Conches, these big shells, are everywhere. Although conches were still commercially caught in the Bahamas, there was a sizeable population here. In fact, I was surrounded by hundreds and hundreds of bonefish! Shortly after, I spotted nervous water in several places that are concentrated on a few square meters. I immediately thought about large schools of mullets having found refuge in these shallow waters to escape predators. As I get closer, however, I began seeing fins and tails piercing the surface everywhere. In fact, I was surrounded by hundreds and hundreds of bonefish! But then I also realized that I was not the only one interested in these enormous “schools” of fish. Five or six lemon sharks, about one and a half meters long, and two large barracudas had materialized on the flat.